There were 4 tenders ready to carry passengers to the pier, about a 5 minute ride. We decided to go out for breakfast since we did no grocery shopping yesterday. There are lots of choices close by and we stopped at a place along the main drag which runs along the waterfront. 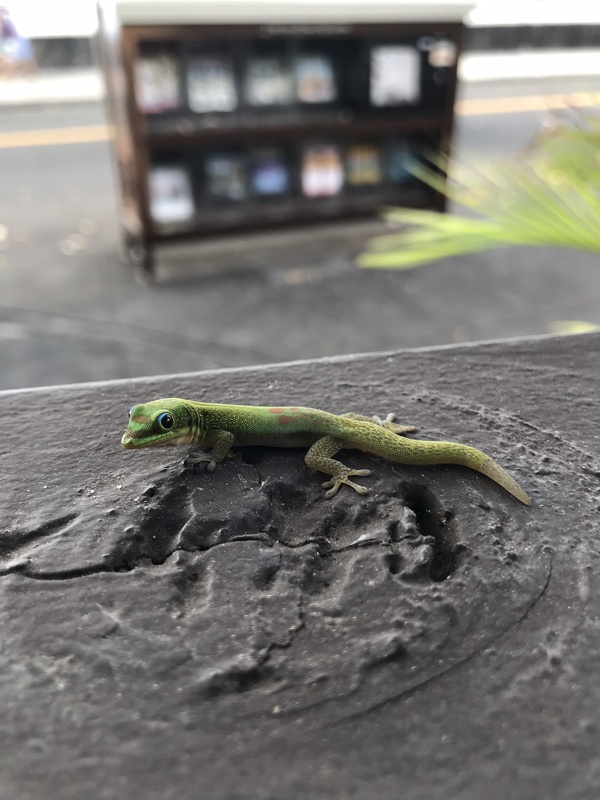 A cute little gecko came along the rail looking for a handout. We went back to our place to think about what to do with the rest of the day. The lanai is a pretty comfortable place to spend time. Nice places to sit and have a cup of tea. Before we knew it was time to think about lunch, still no groceries so out we went, settling on Kona Brewing Co. where we have gone most times we’ve been here. Nice to be able to sit outside. And have a nice fresh beer. We carried on, Kathy to check out a few places to look for art supplies and me back along the waterfront. The pier area was buzzing with lots of people, mostly passengers heading back to the ship. The little boat on the left is one of the tenders just coming into the pier which is on the right. This is the bay where the Ironman triathlon starts. Hundreds and hundreds of swimmers head out toward the big building ion the background which is right next to our place. and full of all sorts of places ready to separate tourists from their money. I don’t think I’ll be driving anywhere today so probably no groceries. It’s 2:45 and maybe Kathy will stop at the nearby farmers market for some fruit. This might mean a walk next door to Don The Beachcomber’s where we were yesterday. After the big lunch earlier, maybe an appetizer will be enough. Kathy just arrived back with a nice Hawaiian dress and some breakfast supplies. More later . . .
Our condo has a small pool right by the shore. A big wave will splash water onto the pool deck. 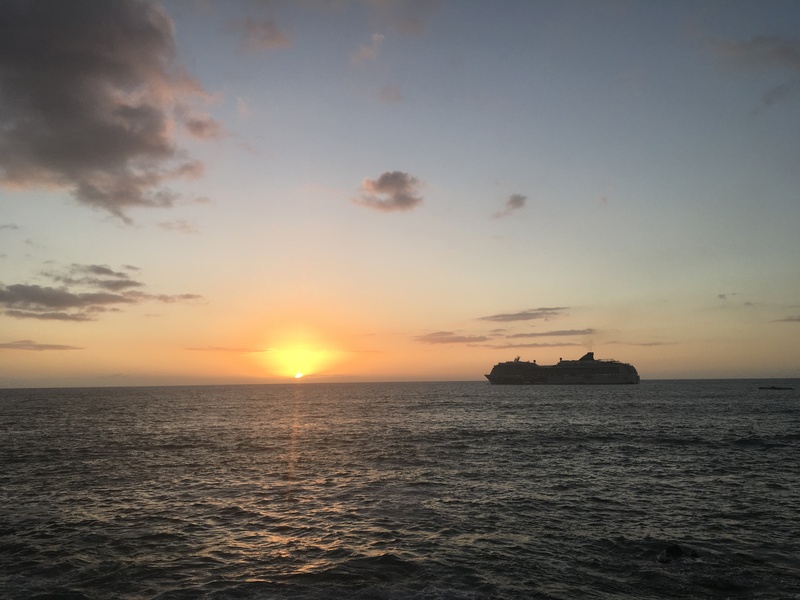 As the sun was setting the cruise ship sailed away. Meanwhile, there was quite a crowd gathering next door for a luau. As we were leaving our place to find some dinner saw a little dog that reminded us of Greta. We ended up next door and had a good seat where we could enjoy the luau dancers at the same time as music from the bar; Beatles, Tom Petty, etc. quite a mix. Kathy looked great in her new dress. The luau is happening on the other side of the hotel pool.